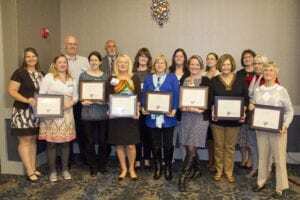 Since 1960, the Ohio Local History Alliance, in partnership with the Ohio History Connection, has led the state in recognizing excellent projects, programs, and publications produced by Ohio’s historical societies, museums, and related organizations, as well as the individuals who make them happen. Submit your nominations so others can be inspired by your achievements. Individual Achievement Awards recognize people who have made outstanding contributions to Ohio’s historical societies or history museums or to the understanding and appreciation of state or local history, while History Outreach Awards recognize outstanding projects that have educational content, that have contributed to the promotion and understanding of local and state history, and that have had an impact on the community – in other words, projects that inspired, connected, and educated their audiences on local history. Public programming, media and publications, and exhibits or displays are all eligible for History Outreach Awards. Read the full guidelines before applying. Award nominations must be submitted by August 1, 2017.